S0570. 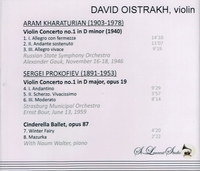 DAVID OISTRAKH, w.Naum Walter (Pf. ): Cinderella – Winter Fairy; Mazurka; w.Bour Cond.Strasburg Orch. : Violin Concerto #1 in D [Played by the dedicatee Oistrakh, who premiered the concerto in Moscow on 16 September, 1940] (both Prokofiev), recorded 1959; w.Gauk Cond.USSR State S.O. : Violin Concerto #1 in d (Khatchaturian), recorded 1946. (Canada) St Laurent Studio YSL 78-034. Transfers by Yves St Laurent.